When my son was a little guy, he loved carrot soup. 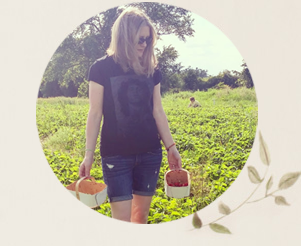 Those were the days - when I could easily get his toddler self to scarf down bean stews, lentil soups and all kinds of nutrient-dense, mama-made entrees. He's 15 now and he has long been exposed to the wonders (salt, fat, sugar) of takeout food. Still, I do what I can to make sure he eats healthy at home, so I thought I'd try putting carrot soup in rotation again. Worst comes to worst, I love fresh, homemade vegan carrot soup myself. When I last made this Carrot Coconut Soup, my son may have turned his nose up at it. In fact, he may have made himself a "hashbrown" sandwich, made up of fried hashbrown patties tucked inside a tortilla wrap with a sauce of mayonnaise mixed with sriracha. Sigh. 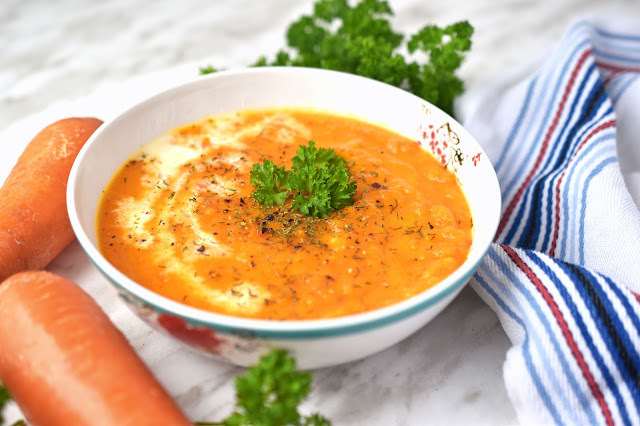 But even if he eats a small bowl of this carrot soup alongside his other meal selections, he'll get a good serving of vegetables. There are eight carrots in this soup, which serves six people. The soup is vegan, which means it's free of dairy and eggs. It's also naturally gluten-free. I have included a potato in the recipe to add to the creaminess when it's blended. I think we sometimes take carrots for granted. They don't often play a starring role in our meals. 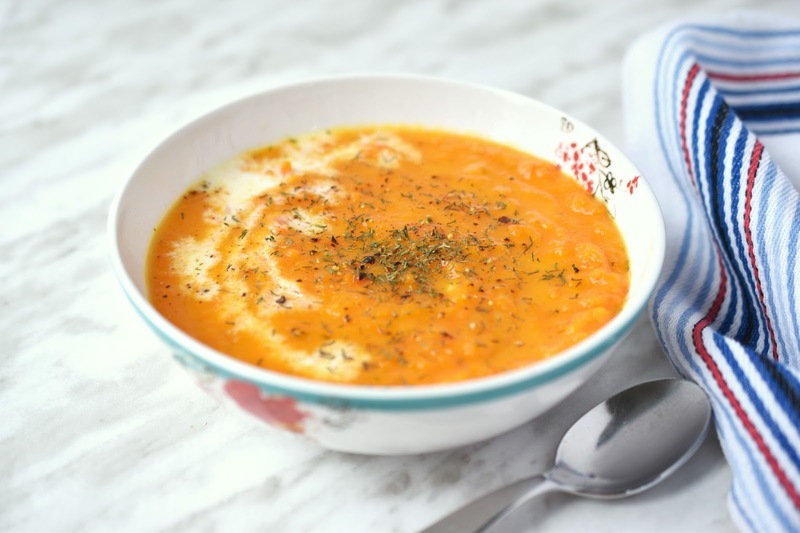 This Carrot Coconut Soup allows their sweet flavour to shine. Carrots, as we know, are very beneficial health-wise. These root vegetables are rich in beta-carotene, vitamin K, potassium, fibre and antioxidants. Carrots have long been associated with eye health too. The "coconut" in my Carrot Coconut Soup comes from 1/2 cup of canned (full-fat) coconut milk. The coconut milk adds creaminess and gives a subtle coconut flavour. You can also saute the veggies in coconut oil in the first step of the recipe, but if you're not a fan of coconut oil, olive oil works well too. 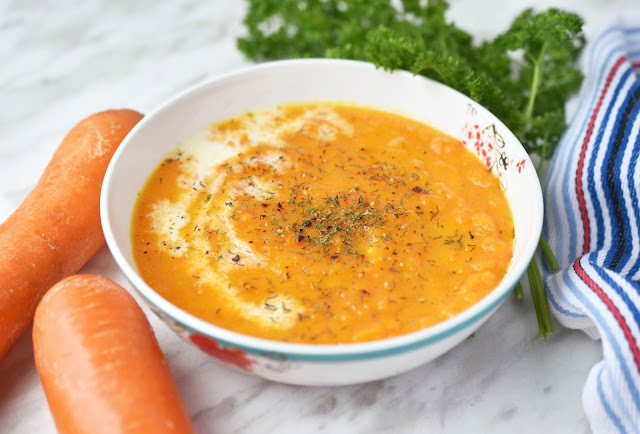 This Carrot Coconut Soup is equally appropriate as a main dish for a casual weeknight dinner or as one part of a more elaborate meal. Serve this soup with a baguette and a salad for a complete meal, or use it as a starter for a special meal, such as Thanksgiving or Christmas dinner. Dress your soup up with a drizzle of coconut milk and some dried and/or fresh herbs like dill and parsley. 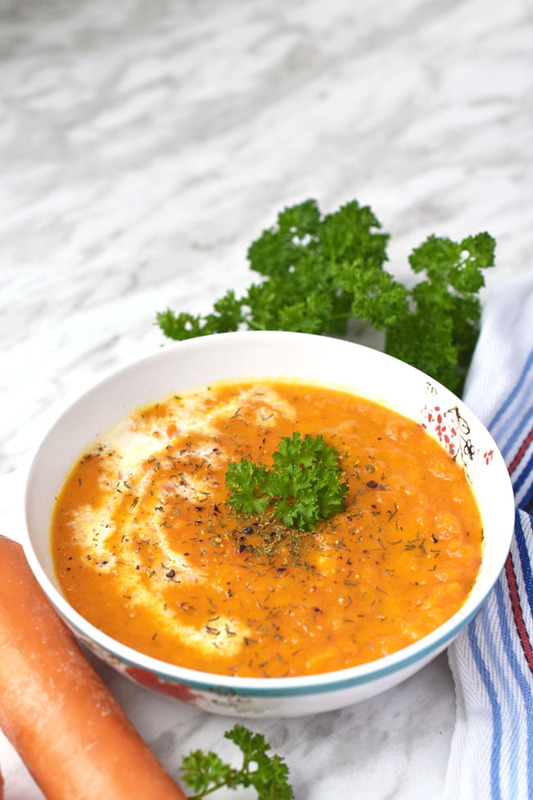 Carrot Coconut Soup is simple to make, requires very few ingredients and tastes delicious. Great for hungry toddlers and teens...if you can get the latter to eat the soup. "Open the hangar, here comes the airplane" game perhaps? Do you like carrot soup? 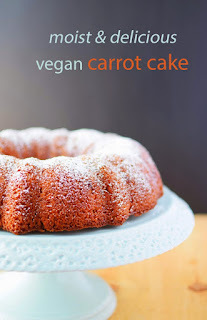 What other recipes do you make that feature carrots? Heat oil in a large pot over medium heat. Add onion, carrots and potato and cook, stirring often, until onion is translucent, about 10 minutes. Add garlic and saute for a minute or so. Add vegetable stock. 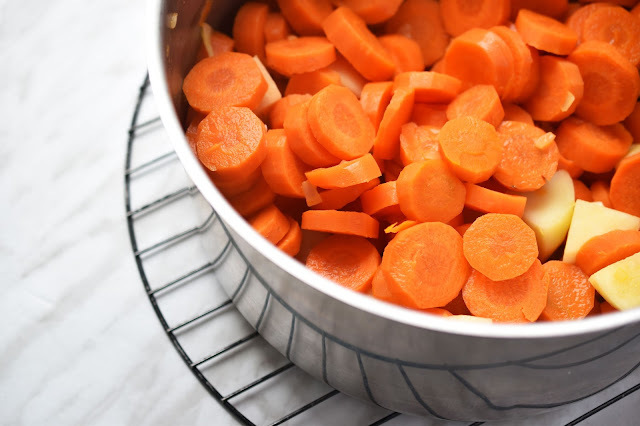 Bring to a boil, reduce heat to medium-low, cover pot partway with a lid and simmer for about 20 to 30 minutes, until carrots are tender. Remove from heat and stir in coconut milk, dill, salt and pepper. 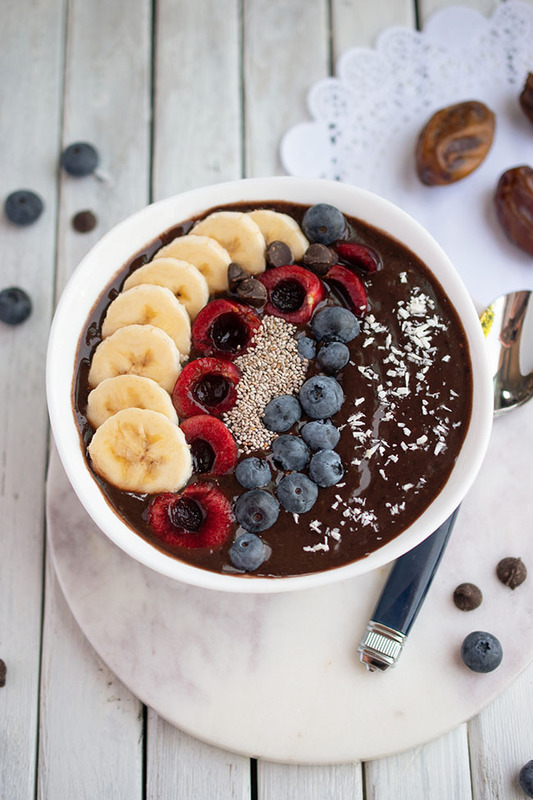 Blend soup with an immersion blender or remove some of the soup to a blender to blend and then return to pot. Leave some of the veggies a bit chunky. Be careful not to burn yourself when transferring or blending hot soup. Reheat soup gently if desired. Do not boil it. Saved this recipe and will definitely give it a try. Soup weather is here! What a great soup recipe! Love, love, love carrots. Just in time for these colder days. Thank you!